This is a marinated grilled shrimp recipe, or bbq shrimp, that is so easy to prepare you will wonder why you don’t barbecue shrimp more often. If you haven’t been sure about how to bbq shrimp, you will see just how easy it is. Prepare the shrimp marinade by combining the garlic, ginger, teriyaki sauce, clamato juice and lemon juice. With scissors, cut the shrimp shell and remove the black vein. Leave the shell on. Put shrimp in a large bowl and cover with the marinade. Marinate for about 1/2 hour before grilling. Preheat the barbeque to medium. Grill shrimp for 1 minute then turn over, cover the grill and cook for another 2 minutes. You can use shelled shrimp, just don’t marinate for too long or the lemon juice will begin to cook the shrimp. 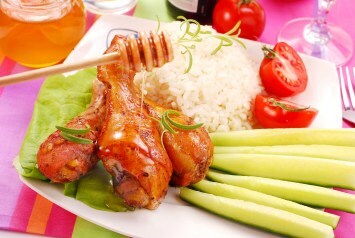 Marinate for about 15-20 minutes before cooking. Watch shrimp carefully when they are on the bbq, as they cook quickly, especially without the shell, and you don’t want them to dry out. Shrimp is a wonderful main course to grill because it cooks up so quickly and takes the flavors of a marinade or sauce really well. The marinade recipe for grilled shrimp that you will find here is easy to put together and keeps the shrimp nice and moist while they grill. This is a perfect diabetes diet recipe. Just make sure you read the label on your teriyaki sauce to make sure it doesn’t have a lot of sugar. Or replace it with soy sauce, just to make sure. It will still be great. If you really need this recipe to be totally gluten free, please read the ingredients on your teriyaki sauce. Some of them are gluten free but some are not. 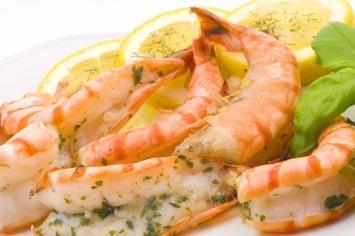 Mmmmm shrimp on the barbie…not just for the Aussies any more! If you like this recipe, I’d love you to Pin it to Pinterest, Tweet about it, Like it on Facebook and add a comment and your own recipes below. If this grilled shrimp recipe sounds good to you, you will want to look at our other fish and seafood (including salmon) recipes here.